TORONTO - While desperation might not have crept into their minds as they limped out of Texas Sunday, the games have become more urgent for the Red Sox. Each at-bat, each pitch has gained a measure of importance not felt in April or May. The calendar had begun to catch up with them. So in the face of an encroaching Rangers team and a playing-out-the-string Blue Jays team, the Sox took advantage of the latter, parlaying Toronto’s wrongs and their own rights into a three-game sweep. It was a return to solid offensive and defensive baseball, with 24 runs scored in the three games, the series finishing up with a dominant performance from Jon Lester in last night’s finale, an 8-1 win in front of 22,817 at Rogers Centre. The games were especially key considering their next foe. Having lost 4 of 4 to the Yankees in their last battle, the Sox play host to the team ahead of them in the American League East standings for three games, starting tonight. And it’s clear, from the way the Sox played over these three games, that they are coming into another Yankees weekend in a far different state than they did last time. “We’re swinging the bats well,’’ Dustin Pedroia said. “We’ve just got to keep it going. Lot of good at-bats. We’re headed home right now and hopefully we can get on a little run here. Thanks to a combination of a lockdown Lester and a taking-flight J.D. Drew, the Sox only briefly were in trouble before surging to a lead in the fourth inning. 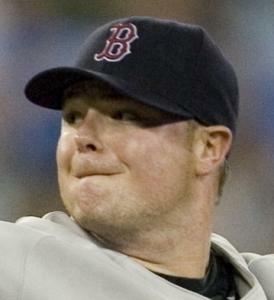 In the first, Lester allowed an infield hit to Marco Scutaro, a double to Aaron Hill, and a walk to Vernon Wells. That loaded the bases with no outs, with Rod Barajas up. But Barajas grounded into a double play started by Alex Gonzalez, scoring one, and Lester finished off the Blue Jays in the inning with a swinging strikeout of Kevin Millar. “The first three hitters reached base and we’re sitting there thinking, ‘Let’s get a ground ball to Gonzie and minimize the damage,’ ’’ Francona said. “That’s exactly what he did. “From there, I think he had a 22-pitch inning, and then you look up about four innings later and he’s at 55 or 60. I think tonight was probably the worst he’s been [in] first-pitch strikes, but he used his changeup and again they were aggressive and he took advantage of that and he ends up pitching eight really good innings. Toronto rarely challenged after that. Lester retired 14 of the next 15 batters, allowing only a walk to Jose Bautista in the second. Eleven straight Blue Jays made outs before Hill singled with one out in the sixth. He didn’t stay on base long, with Lester getting a double play ball from Wells. Still, there wasn’t a lot of praise from either Francona or Lester regarding the stuff he had. What he did with that stuff? That was another story, as he took advantage of some aggressive Blue Jay batters. Of the 27 he faced, just eight got first-pitch strikes. “I was pretty much fighting myself the whole game, as far as getting into a rhythm and executing pitches,’’ said Lester, who allowed just one hit after the first inning. “But I mean, obviously, that’s a big play right there [in the first], minimize the damage as best you can and try to get out of there with as few runs as possible and I was able to do that. “It was one of those deals where I made some pitches when I had to, and got some early outs, which helped out the pitch count. We had a couple nice double plays which were turned. With Drew blasting two homers from the eighth spot in the lineup, the run support was there. Victor Martinez added a homer, and the Sox benefited from an odd error by Toronto starter Brett Cecil in the fourth inning (he mistakenly threw a live ball into the dugout, in anticipation of getting a new ball from the umpire). Not that it seemed Lester would need much. “That’s big for us, more mentally than anything, to prove to ourselves that we can swing the bats,’’ Lester said. “It’s one of those deals where I don’t think our slump - or whatever you want to call it - was going to last forever. We’ve got too many guys on this team that can swing the bat too good to hold us down too long.